The people of Mayfield know this all too well. On May 10 a tornado struck the area leaving several homes, barns and businesses damaged, some of which were completely destroyed. While the damage was devastating for those affected, luckily there were no deaths or serious injuries. This structure was an antique business owned by local Mayfield businessman Dwain Warren. Most of the building was destroyed by the storm. Kentucky Farm Bureau leaders both at the county and state levels immediately reacted to the disaster. 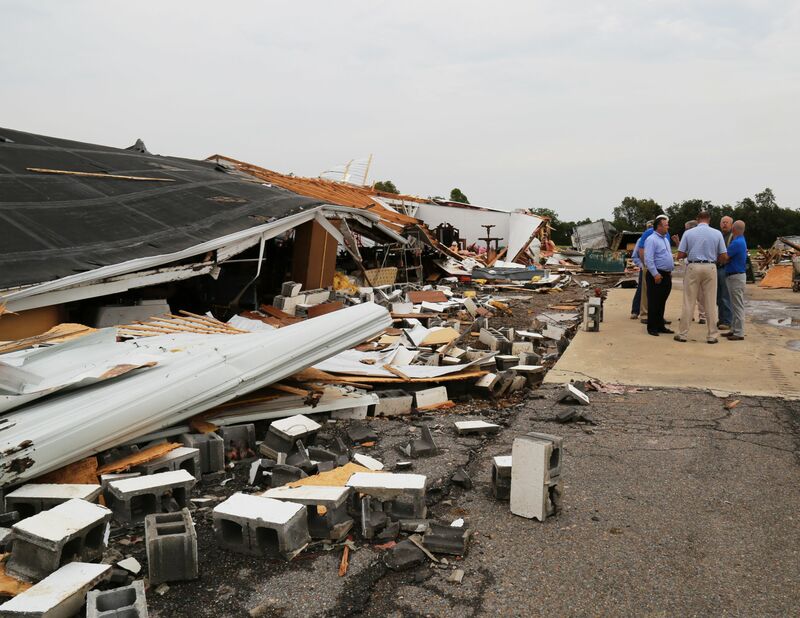 Mike Cartwright, the KFB agency manager in Graves County said he and his office staff watched the storm move through the area from their building knowing there was going to be a great amount of damage caused by the tornado. He immediately informed the staff to be prepared for calls. One such call came from local businessman Dwain Warren, the owner of a local antique store. “I was not at the business at the time of the storm but I got a phone call and was told the store was destroyed,” he said. And that it was. Most of the structure was completely blown away and while people were in the building at the time of the tornado, no one was hurt. KFB President Mark Haney led the state team on sight after the storm hit. He said it’s remarkable the amount of damage that can be caused by such a weather event in an instant. “It’s amazing what just a minute or two can mean in the destruction to a lifetime of assets and we were there with a team to try and put lives back together as quickly as possible,” he said. 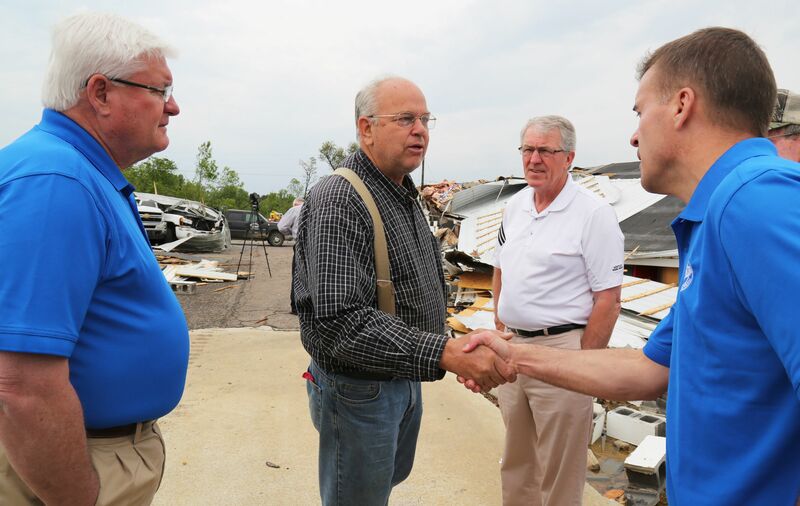 John Sparrow, CEO of the KFB Mutual Insurance Company, right, shakes hands with Dwain Warren, whose business was severely damaged by the Mayfield tornado. Also pictured are KFB President Mark Haney, left, and KFB 1st Vice-president Eddie Melton. John Sparrow, CEO of the KFB Mutual Insurance Company, also visited sites in Mayfield affected by the storm. He said whenever the reports start coming in about potential bad weather, it’s a time of concern for everyone. Haney added that it’s difficult to see something a person has worked for all their life reduced to rubble and knowing that something like this storm is a reality of the world in which we live. 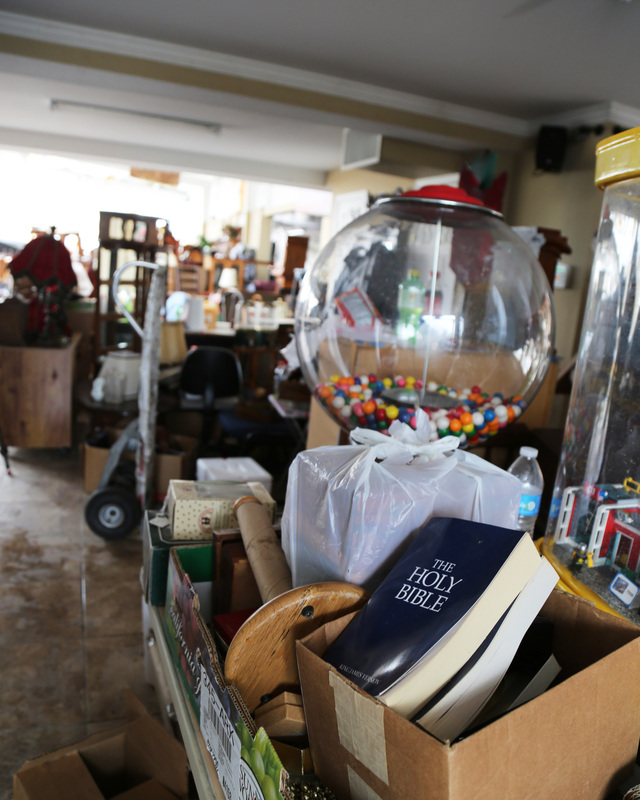 Much of what was left and undamaged in the antique store was boxed up and moved shortly after the tornado struck. According to information from the National Weather Service (NWS), in an average year, 800 tornadoes are reported nationwide, resulting in 80 deaths and over 1,500 injuries. · Tornadoes can occur at any time of the year. · In the southern states, peak tornado occurrence is in March through May, while peak months in the northern states are during the summer. · In some states, a secondary tornado maximum occurs in the fall. · Tornadoes are most likely to occur between 3:00 and 9:00 p.m. but have been known to occur at all hours of the day or night. · The average tornado moves from southwest to northeast, but tornadoes have been known to move in any direction. The average forward speed is 30 mph but may vary from nearly stationary to 70 mph. The NWS notes, the key to tornado survival is a safety plan. Get as low as possible - completely underground is best. 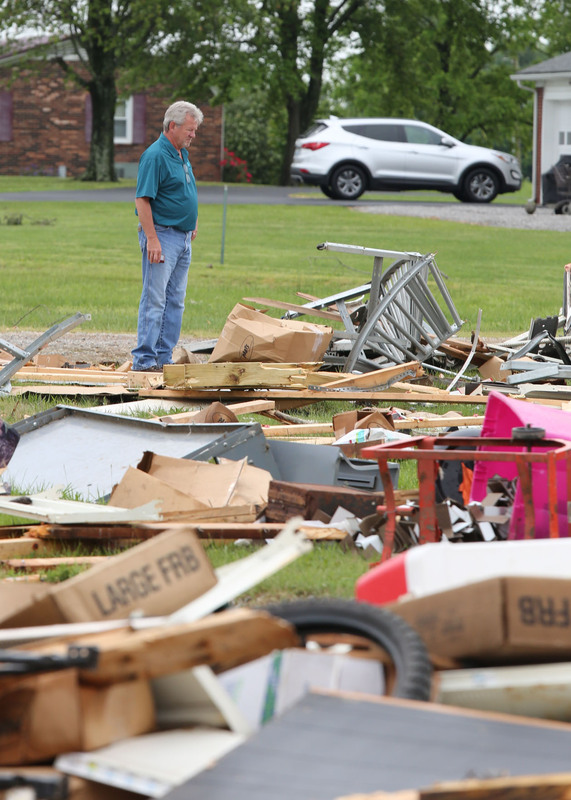 Some areas in Graves County suffered extensive damage due to the tornado that struck on May 10. Put as many barriers between you and the outside as possible. Stay away from doors, windows and outside walls. Bathrooms, closets, hallways and under stairs may be adequate safe areas in the event a basement or underground shelter is not available. If caught outside and no shelter is available, lie flat and face-down on low ground, protecting the back of your head with your arms. Get as far away from trees and cars as possible. If in a car and no other shelter is available, you may be able to drive out of its path by moving at right angles to the tornado. If you are caught by extreme winds or flying debris, park the car as quickly and safely as possible -- out of the traffic lanes. Stay in the car with the seat belt on. Put your head down below the windows; cover your head with your hands and a blanket, coat, or other cushion if possible. If you can safely get noticeably lower than the level of the roadway, leave your car and lie in that area, covering your head with your hands. Avoid seeking shelter under bridges, which can create deadly traffic hazards while offering little protection against flying debris.